I went for an orientation last night to volunteer as a referee for a boccee tournament at the Senior’s Games next weekend. I have played campground boccee many times and discovered that we always play with house rules or “my house my rules”. We have added and subtracted from the list as the kids and grandkids became more proficient. We created a ‘golden ball’ option that meant that for that end all points were doubled. This was meant to give the younger ones a chance to catch up. The official rules of boccee don’t mention golden ball. 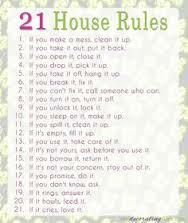 How many house rules have you created to adapt to circumstances and participants? Are they still needed? Valuable? Working?